A new wave of imaginative fund raising is getting a grip of great chunks of England, at these days - Jumble Trails. 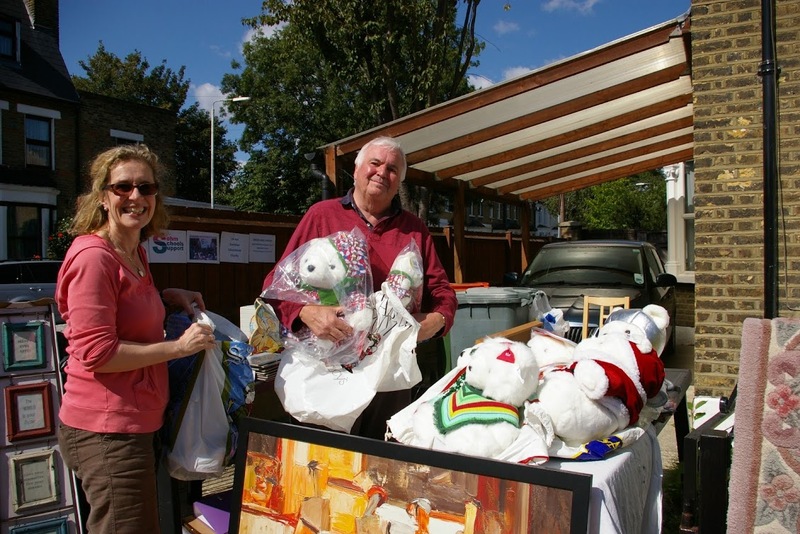 These are a combination of yard and car boot sales, where, through a bit of co-ordinated effort, neighbours in a locality arrange to have yard sales, simultaneously. Our are had one on Sunday - when over 100 houses in a small part of our neighbourhood in Forest Gate held one of these events. We asked for donations of unwanted items from friends and relatives and set our stalls out in a couple of local front gardens/drives. It was great fun, as hundreds of people enjoyed a pleasant sunny day by wandering around their area, chatting to neighbours and snapping up bargains. We were delighted to raise over £350 (including Gift Aid) from the day, and cleared a bit of much needed space in a few friends' houses! Attached are some pictures - showing all the fun of the Jumble! A big mention to Sarah Baylis for the donation of a number of teddy bears, which were snapped up by doting grand parents and other charity organisers, with an eye to great prizes for future raffles. The money we raised will enable us to ensure we can provide most of the stationery needs of either the Lower Basic of Senior Secondary school, when we next visit The Gambia, hopefully in January next year. Thanks to everyone who donated items for sale, and to those who purchased them! This year we were able to take an unprecedented 55 boxes and crates of donations to our Sohm schools, via container space kindly provided, free of charge, by our good friends at Football Gambia. The logistics were difficult and time-consuming. But the results were spectacular, and incredibly well received, as we will describe, below. The photo of the loaded truck gives an indication of some of the transport challenges we were presented with in getting the donations to the Sohm schools! They donated 30 good-order computers (desk tops and laptops), that they were upgrading, together with a number of keyboards, mice (mouses? ), and desktop printers. We paid to have them overhauled and cleaned up and to have a modern Windows Office suite installed on each of them, and provided ink supplies and back-ups for the printers. The vast majority have gone to the Senior Secondary school (with a small number going to the Lower Basic -primary - school). Donated a range of redundant/surplus school science equipment (microscopes, electrical testers etc) and maths and English text books, together with a range of school library books and an assortment of dictionaries. These have been distributed between the two schools and are greatly appreciated. The senior school had NO science equipment until we made a small donation last year - relying solely on book- learning to understand the principles of science! The Lower Basic (primary) school has no complete sets of textbooks in ANY subject, for class use. The donation of English and maths books will be a great boost to encouraging the youngsters to work on their own, and negotiate their way around text books. Key learning skills! It is so easy for schools and others in the UK to discard what we regard as out-of-date materials and consign them to dustbins - but they can offer such benefit in remote communities in developing countries. And are massively appreciated by people who do not benefit from Western wealth. Newham Woodcraft is currently celebrating its 80th anniversary, and are embarking on "80 Greats" (or initiatives)to commemorate the achievement. The pupils of Sohm's Schools have been the beneficiaries of one of these. Inspired by the imagination and generosity of group leader, "Bill" Bremner, Newham's "Woodies" donated and restored seven bikes for the use of the Sohm schools and their students (see them being transported in the photo, above!). These are highly prized and sought-after, and can each massively reduce the travel-to-study time of many pupils currently walking and hour each way in searing heat, from remote villages to get to their local school. One of the bikes has been given as a "staff bike" to the Lower Basic school, which will be used for contacting parents swiftly, when their children fall ill, or have difficulties at school. The others will go to those pupils with the furthest travel-to-school journeys at the Senior Secondary school. his luck, with the boots! Additionally, Woodcraft, themselves were recently given 25 pairs of good condition, second hand, hiking boots. These were surplus to their own needs and requirements, so were sent to Sohm. They have been welcomed as if they were gold-dust, being highly prized for confronting the floods in the very rainy summer season. We look forward to delivering more surplus equipment and stock in future years - but there are big questions over our ability to access free/low cost transport for the future. We will keep plugging away to find the ways and means, if our generous donors can continue to extend their generosity. So, a huge thanks to our supporters, above, for their material donations. The cash donations given by many others, too many to mention here, have enabled us to pay for customising the ICT equipment, and funding the other projects we have considered on this blog over recent months. Just back from our annual visit to Sohm, and there's great news to report on considerable progress over the last twelve months. This is the first of three newsletters, over the coming months, in which we record some very considerable achievements. We were delighted to pay for the repair of the main nursery class, during the year. This meant that broken doors, windows and roof could be restored and dangerous cracks in the plaster-work walls could be fixed, so that the room is back as a functioning classroom. See below for "before" and "after" photos. Decor and paintwork are not a priorities in the cash-strapped Gambia, so the room still looks scruffy - but is now a lively base for 35 youngsters! We were able to make a small donation during the year to fix the teachers' accommodation block. So, for the future, 15 teachers can look forward to rooms that don't let in water during the rainy summer season, and can wash in safe showers. Once again, the standards of decoration fall below Western standards and expectations. But, the teachers are delighted, particularly at the prospect of a "dry" summer! The Lower Basic school's head's office plays so many roles, not the least as a meeting room for almost all activities involving staff and parents, in the school. But for years the dirt floor has been infested by termites and most solutions have been, at best, temporary. So, this last year we were delighted to pay £30 for the cost of ceramic floor tiles and cement. all for £30 SSS donation! The result - a delighted and proud head, decent floor covering and a termite-free meeting room. A small sum, for a big difference! Stationery - and moving forward! Each year me make an annual donation to each school (benefitting over 800 pupils)that ensures all of them will receive at least one 120 page exercise book and a maths work-book, plus appropriate pens, pencils, crayons, drawing papers, erasers, sharpeners etc. - give the students the tools! See the piles of stationery ready for distribution. No wonder the pupils are delighted and both schools have seen improved exam results, as pupils and students are given the tools to assist. As a result of SSS's efforts, the Senior School now has key text books for every student in every subject to share, together with some key ICT and scientific equipment. The impact has been dramatic, confirmed by a national Ofsted-type inspection. The school has shot up from about fiftieth place in the region's schools' league table, to second out of 85, over the last four years (since our intervention). The Education Permanent Secretary, Regional Director, school's head, staff and PTA are all absolutely delighted and are under no illusions for the reasons. They put it down to being able to mobilise the gifts that SSS has made to the schools. The students have been better equipped to deal with the challenges that face them, in public examinations and professional assessments. They are all most grateful and have asked us to convey their extreme gratitude to all of our donors and supporters, which we are delight to do! So, thank you all for helping make such a difference!! The Gambian government rewards the best performing schools, believing that they provide best value for money and are more likely to benefit from more investment than poorly performing schools. The two schools we support in Sohm have been major beneficiaries of this policy. Our investment has been like start-up money, which results in further state investment. And, the PCs are fired up! So, as a result of our investments in the senior school (see above), the ministry is now paying for the construction of an additional teaching block (see photo) and has paid for the whole school to be refurbed (also photo). Best of all, however, the school has just been linked up to mains electricity - which we have lobbied for, over the last five years. On the last day of our visit to the school, this year, the school was linked to the grid, and mains electricity flowed.